Architecture studio tenfiftyfive have recently completed an addition to an old heritage house in Melbourne, Australia. Black steel windows that project away from the timber facade of the extension create a strong visual contrast. At the rear of the house there’s an outdoor space for indoor/outdoor living. Black framed windows provide a glimpse of the interior, while a swimming pool provides a place to cool off. Exposed concrete surrounds a window with a wood ledge and when the window is open, it can be used as a counter or desk. The interior of the home features materials that will age and patina over time, creating a sense of warmth. An exposed recycled wood ceiling runs the length of the living room and kitchen. In the kitchen, red brick, some of which was recycled from the garden paving, covers the wall and compliments the timber paneled cabinet doors and the Statuario marble used for the counter tops and island. Behind the kitchen is the pantry that has open black steel shelving as well as recycled wood shelving. Polished concrete floors are used throughout the main floor of the home. Next to the kitchen is a two story void over the dining area. The void was created to allow winter sunlight to fill the space. Above the windows in the dining area is a green wall that provides a touch of nature to the room. Wood stairs, sandwiched between a white wall and a brick wall, are lit up with hidden lighting on either side. 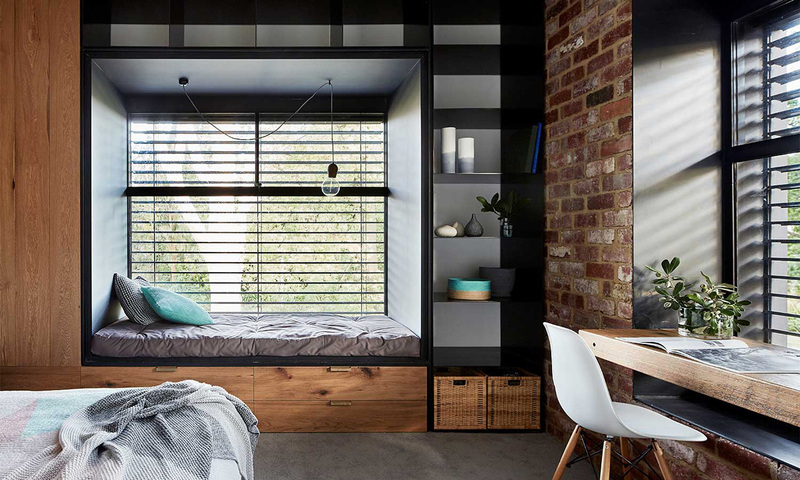 The steel windows on the exterior of the house also push into the bedrooms, where futon mattresses are used as day beds to create the ideal built-in nook. The bathroom is kept bright and airy with the use of glass partitions and white walls and tiles. Black accents are used throughout in the form of frames and tile grout.